I worked all last week on the bunnies. I knew I wanted the stitches to be related but I also knew I wanted them to stitch quickly. I also knew that I wanted a stitch that I could offset and yet by offsetting would not draw attention to the offset areas nor create compensating areas that would draw attention away from the piece. First I stitched the outlines of both the bunnies in a gray continental stitch and I filled in the eyes; then I started on the bunnies. I started with the baby bunny. 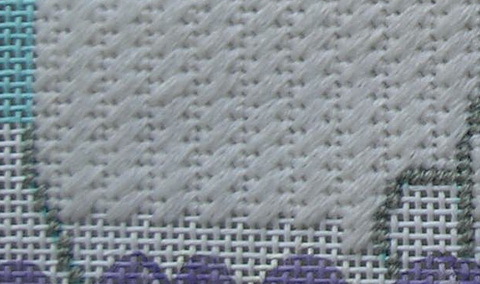 I knew I wanted to use related stitches and the baby bunny should be the smaller of the two stitch choices. If you look at the line drawing I have divided the areas up into offsetting areas. The lightest pink of the baby bunny was stitched first to establish the stitch. I started immediately above the gray outline for the back leg & foot so I could establish a base line across the widest portion of this area. Then I stitched up to but not across the gray outlines; I compensated as I stitched but sometimes if it is difficult to see you can wait and compensate after all the full stitches are placed. I finished stitching one area before I began another. I also left the bottom 4 to 5 rows unstitched until I establish the flowers on the bottom. I love the Nobuko stitch and it does work up fast so I used this for the baby bunny. And I decided that a Double Nobuko would work for Mom bunny. The diagrams of the shows the plan for offsetting both the Nobuko and the Double Nobuko, but like I said I tried to figure out where to place the stitches so I had the least compensation so this may not be the exact placement I used. When I moved to another area (let’s say the med pink of the face) I offset the stitch by one thread and stitched a full row across the area and then filled in as necessary above and below this base line I established. 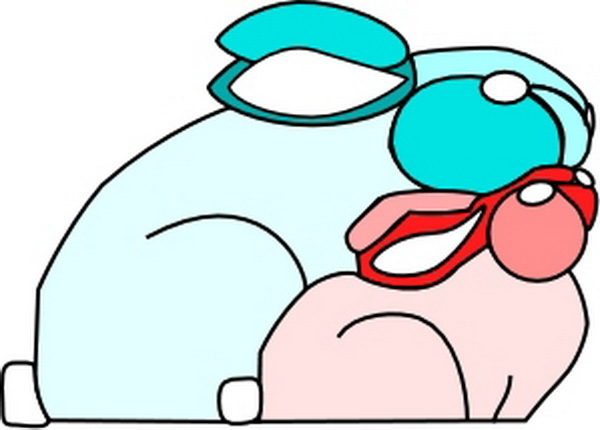 I continued in this manner for the nose/upper head and ear areas of the baby bunny. In the smaller areas I tried to figure out where I could place the most whole stitches so that compensation was kept to a minimum. 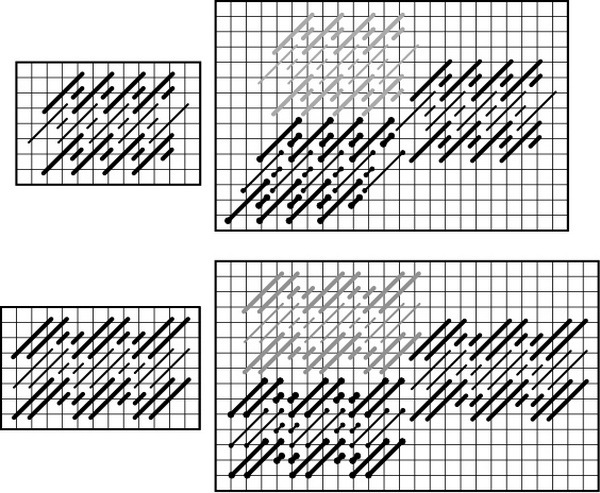 I could have used any number of stitches and I have shown you a few in the diagrams here. 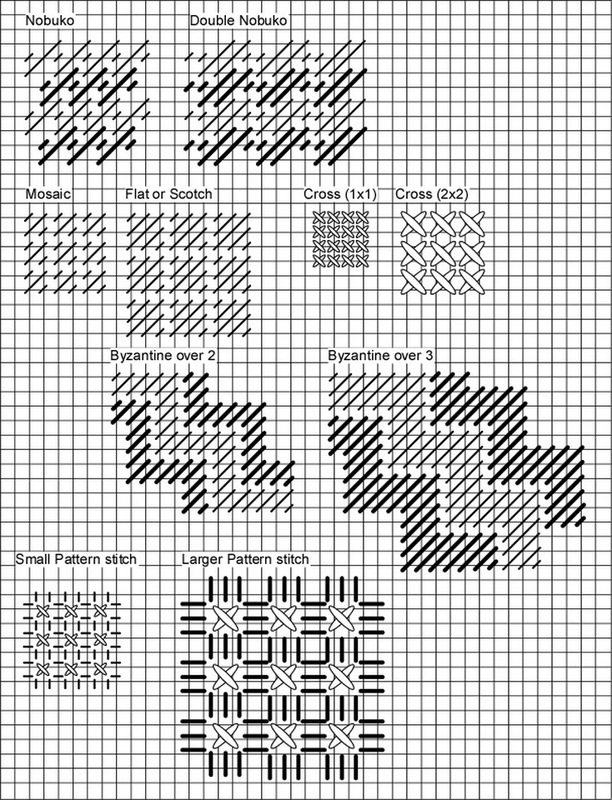 Not only can you expand a stitch but you can also create similar pattern stitches to use in your needlepoint. Ann Strite-Kurz has written some excellent books (any of her books are good) on this subject: Potpourri of Pattern; The Science of Canvas Embroidery; and Stitch Variations and Mutations; Diaper Patterns. You can see her books and kits here (http://www.needleartworks.com/dsgnr/ask/askimages.htm), but I think you order directly from her. 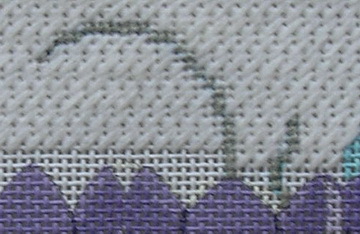 She also writes a column in Needlepoint Now (http://www.needlepointnow.com/), Using Common Stitches in Uncommon Ways.” You will get more ideas for stitch patterns to use here too. But back to Mom & Me… I finished stitching Mom and baby bunny but left the bottom several rows unstitched until I figure out the flower design which I am working out on the computer first. I know the width I have to work with and I also have an approximate height so I am hoping this won’t be a big deal. I have an idea in my head and I hope it works out. I am stitching the pink of the bunnies ears in padded Gobelin…baby is Straight Gobelin Mom will be Diagonal Gobelin. Noses for both are Basketweave. Again, this week the weather is spring like but by Wednesday the killjoy weather people are predicting white stuff…I’m hoping they are off their rockers. But whatever the day brings I know that spring is coming and I can hardly wait!